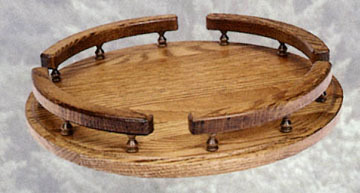 Here is our 14” round lazy susan condiment tray with rails. Made by the Amish of solid oak, it features rails on the sides to keep things from sliding off and a handy rotating swivel base to make it easy to rotate everything into position as needed. There isn’t a whole lot more to say. When you order it we will be happy to have it finished to match your table and chairs, our picture illustrates a medium oak finish.